We are now OPEN LATE THURSDAY. To help for those fighting the traffic use our secure drop box for your keys. See our 'About Us' page for more detail. From 1 July 2014, vehicles first registered anywhere in the world on or after 1 January 2000 will move to annual WoF inspections for their lifetime. For new vehicles, after an initial inspection, another WoF inspection won't be required until the 3rd anniversary of their first registration. At Mechanix, we recommend that you do not make it a year or two between visits. There are still many things that can, and often do, wear out on your car. Tyres are a good example. If your wheels are even slightly out of alignment, you can easily chew the edges of your tyres and reduce their ability to help you stop safely. Please do keep an eye on your tyres, or just call in and see us if you have any concerns. A quick tyre inspection can take just a couple of minutes and we won't charge you anything for that! Other small things like wiper blades and headlight bulbs can often be overlooked or forgotten, when it is actually a very simple and minor job to sort out. Equally, there are things within your vehicle that you won't notice, but were previously picked up by a WOF inspection, eg suspension issues, which again, can have a significant impact on your ability to stop! Most accidents are of course caused by failure to stop your car in time, so good tyres, good suspension and effective brakes are vital. Bottom line, if you are getting your vehicle checked and serviced regularly, then we should pick up on most things that could cause you problems. So don't be a stranger, make sure we can keep an eye on your car and help to keep you safe on the roads. We are usually there just before 8am, but otherwise just park your car and use the secure drop box so you can get away early! Our Mission: "To be the best we can in all that we do." 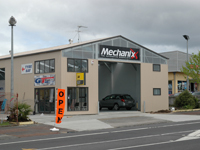 The team at Mechanix are here to look after you. We guarantee everything we do 100% and will do whatever it takes to get the job done properly. John is a very experienced and senior mechanic with many years in the trade. He brings a strong work ethic and good diagnostic skills to complement the team. Not one to blow his own trumpet, John is a quiet performer who delivers the goods over and over and can always be relied upon to step up when the going gets tough. Thanks John, always appreciated! When we untie his shackles and let him have his life back, John enjoys riding quad bikes or spending time with his son. John has such an easy going manner we think he must take out his aggression on the quad bikes - as long as he takes care cos those things can be dangerous!